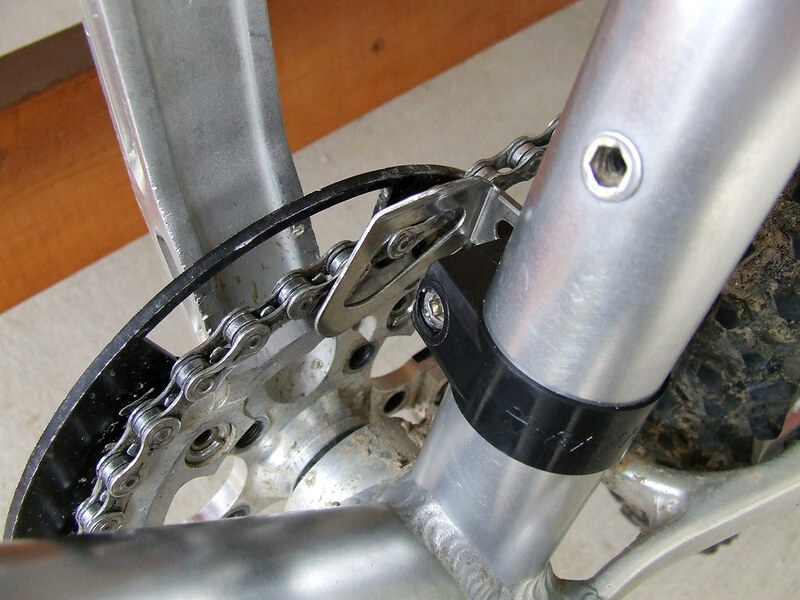 Chain keeper - useful accessory or not? What's the groups thoughts on using a chain keeper when cleaning your bike? Are they useful and worth the price - the Performance Cycles on is $50 CDN - or just a 'nice to have' ? what chain keeper are you talking about? A) to go in place of your rear wheel when you take it out to be cleaned separately? 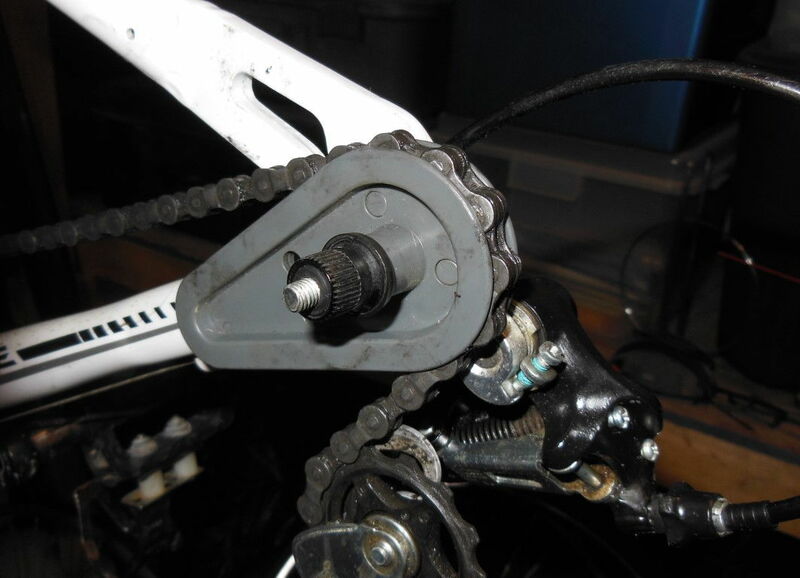 B) there is another, it keeps the chain from going past the innermost chainring..
shifting it as you ride..
plastic hose over an axle , for example..
A couple of my bikes have chain hangers brazed to the seat stays. Can't say I find them particularly useful. Nicely overengineered solution to a practically non-existent problem. Like I said.. with minimum effort you can make a dummy axle with old bike parts..
but happy shopping if you must have something made for you..
What I need worse that one of those (chain keepers) is a bracket to protect the derailer when I pull the rear wheel off to fix a flat. It needs to be sturdy enough to protect the derailer, flip down when needed, flip out of the way when it's not needed, must not rattle, and the ideal weight would be 0 ounces. Nicely overengineered solution to a practically non-existent problem. Yes, nice to have if you're a pro mechanic supporting a fleet of bikes that must be thoroughly cleaned every night. 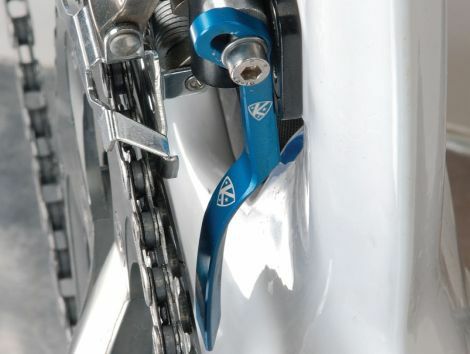 A "chain keeper" could be a) a brazed on peg to hang the chain from when removing the rear wheel, b) a (usually) black plastic guard mounted on the seat tube that prevents over-shifting of the chain by the front derailleur, usually seen just inside the inner chainring of a triple crankset or c) one of several devices used to keep the chain from falling off single chainrings. I have no experience with c). b), those guards that keep chains from falling onto the BB shell when you do a fast sift onto the tiny inner ring of a triple. They are a Godsend. They have only one disadvantage side from costing something and being a little work to put on. It is possible to jam the chain down between the guard and ring and pull it all the way through. This happens when 1) the guard is set too far from the ring (not too hard to muscle it back into place) and 2) by pedaling hard enough right after a sloppy shift to muscle that chain through that small gap. Oops! But if you simply pedal easy enough right after shifting to verify everything is good before you go into root pulling mode, those guards will make for flawless shifts. They work so well the best pro mechanics put them on their rock star race leader's bike before that monserous stage with the 23% grade that will require a triple. Last edited by 79pmooney; 12-06-18 at 01:10 PM. I have one and have used it on a few occasions but I do not find it to be an essential item. Made one myself thinking it would be handy. Used it like 3 times and stopped using. Found it unessasary for 99% of tasks. Won’t get rid of I just in case though. If you don't mind, what's the 1% job for which you need this? For the life of me I can't picture this guard. Do you have a photo??? Ask the LBS if for one of the shipping supports which go into the dropouts when frames are shipped. They probably throw them in the garbage and will likely hand you a few. well really I don't "need" it for anything but I do use it for cleaning. I only now use it really on my MT bike and CX bike, they don't get cleaned very often actually. I did use it on my road bike but I started to wax the road bike chains and that was a great improvement IMO (super clean with wax). I have a race type work stand as opposed to a clamp on the seat tube type not that it really matters but cleaning is about it anymore. I just found it wasn't needed really for most jobs. Excellent tip, Tim. I'm gonna pester my LBS for one of those next time I visit. Well, the chain keeper on my Univega hybrid turned out to be useful tonight. I decided to put fenders on since it's been raining. Normally I do dirty bike work outdoors but... it's raining. I don't have a workstand so I removed the rear wheel and reinserted the quick release/axle to prop the bike on the Cycleops trainer in the living room. It was handy to not have to lay newspapers down to keep the chain off the carpet, or to remove the chain. Even with Missing Links it's not handy with a dirty chain, and I've decided to go with wet lube rather than wax for this bike over the winter. I always run waxed chains on my road bike since I don't ride it when it's wet. Cleaner to handle but wax doesn't stand up to steady rain as well as Park CL-1, which forms a tenacious film after a few days exposed to air, a bit like a cross between grease and tacky wax. It'll hold up all winter here. But the chains are mucky no matter how much I wipe 'em down. Okay, yup, that chain keeper is useful. I'm also reminded how much attention to detail Univega put into some of their frames, even on their mid-range bikes. Besides the chain keeper there are extra places to mount fenders, racks, etc., that I hadn't noticed before. No need for ugly kludge fixes like clamp-ons to support racks or visible clips to anchor the rear fender. This thing was sold as a "lite" version of their classic late '80s-early '90s mountain bikes, but it's more of a touring frame made to appear trendy with a flat bar. It's now wearing a Nitto albatross bar. Now I need to find a good looking front rack to bolt onto the mid-fork boss. Those exist to facilitate quick wheel changes for racers. Marketing allowed them to spread to the whole product line. My solution has always been to brace a screwdriver behind the seat stays to hold the chain. Less elegant but costs less. Last edited by rumrunn6; 12-13-18 at 08:22 AM. 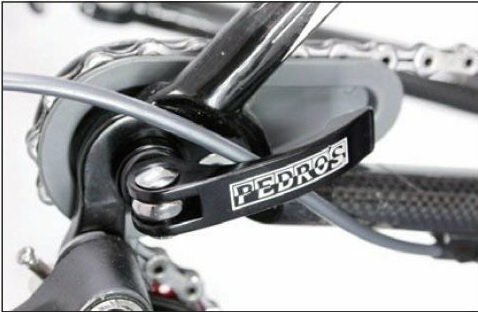 @rumrunn6 that Pedro's chain keeper looks pretty slick and the price is right. Does it work on a thru axle? Last edited by rumrunn6; 12-13-18 at 12:22 PM. What Is A Jump Stop? 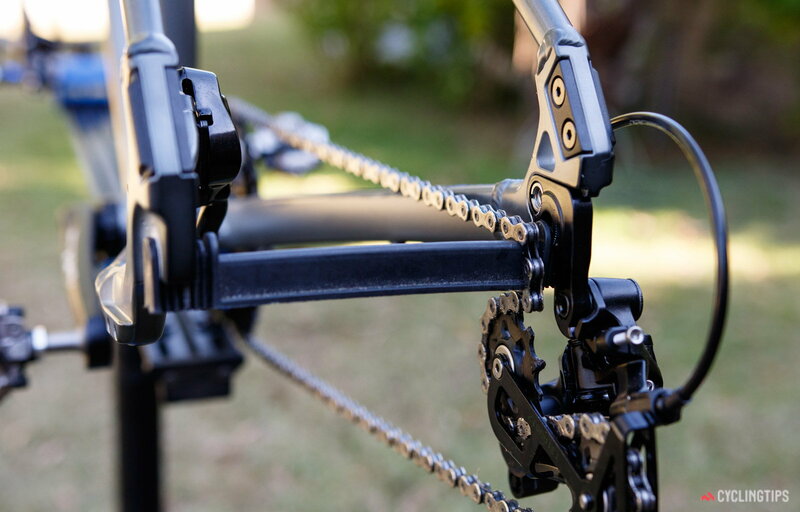 Chain catchers have been a thing for a while now; SRAM incorporated one into their Red FD in the Yaw redesign in 2012. Is there such a thing as a 11 Speed MTB Chain?